The Best Brain Cancer blogs from thousands of top Brain Cancer blogs in our index using search and social metrics. Data will be refreshed once a week. 2.55 Barr's Battle Brain Cancer! 2.77 Toom-ah? What Stinkin' Toom-ah! 2.99 Cancer Girl Smiles | Today I decide to live! Brain Cancer newsletter is a comprehensive summary of the day's most important blog posts and news articles from the best Brain Cancer websites on the web, and delivered to your email inbox each morning. To subscribe, simply provide us with your email address. New Jersey About Blog Get a better understanding of what happens during metastasis brain cancer surgery to ease your mind and better prepare for your procedure. Facebook fans 240. Twitter followers 1,093. New York, NY About Blog Brain cancer news articles and features of relevance to oncology nurses. Facebook fans 2,513. Twitter followers 2,933. São Paulo, Brasil About Blog The mission of Neurosurgery blog is to facilitate the equitable, global dissemination of high-quality health research; to promote international dialogue and collaboration on health issues; to improve clinical practice; and to expand and deepen the understanding of health and health care. Facebook fans 82,647. Twitter followers 51,412. Norwalk, CT About Blog Get latest updates for oncologists and hematologists treating primary (astrocytoma, meningioma, medulloblastoma, ependymoma, brain stem glioma) and metastatic brain tumors. Facebook fans 7,083. Twitter followers 16,629. Santa Monica, CA About Blog The PNI blog covers wide spectrum of neurological and cranial disorders including: brain tumors, skull base tumors, pituitary tumors, and more. Facebook fans 3,553. Twitter followers 60. Hewlett, NY About Blog The Musella Foundation For Brain Tumor Research & Information, Inc is a nonprofit public charity dedicated to helping brain tumor patients through emotional and financial support, education, advocacy and raising money for brain tumor research. About Blog Information and support for patients diagnosed with brain tumors or cancer and their friends and family. Facebook fans 1,166,729. Twitter followers 525,629. San Diego, CA About Blog Tocagen is initially focusing on treatments for advanced cancer patients for whom no adequate treatment currently exists. Facebook fans 2,416. Twitter followers 432. Newton, MA About Blog National Brain Tumor Society (NBTS) is a nonprofit organization committed to finding a cure for brain tumors. NBTS is fiercely committed to finding better treatments, and ultimately a cure, for people living with a brain tumor today and anyone who will be diagnosed tomorrow. Facebook fans 35,320. Twitter followers 5,891. Global About Blog Jessie Rees Foundation is all about giving "CARE" to each child and family. We will care until there is a cure. Help us care for and encourage every child. Ensuring every kid & family impacted by childhood cancer has the support & resources to Never Ever Give Up! Facebook fans 460,335. Twitter followers 267,962. Mountain View, CA About Blog Comprehensive up-to-date coverage for brain tumor treatment, aggregated from news sources all over the world by Google News. Facebook fans n/a. Twitter followers 213,832. About Blog The Mighty is a site where people share their personal experiences with disability, diseases faced. Facebook fans 844,445. Twitter followers 43,758. Milton Keynes, England About Blog The vision of Brain Tumour Research is to find a cure for brain tumours. Its mission is to build a network of experts in sustainable brain tumour research. It shares stories of people affected by brain cancer on its blog. Facebook fans 38,647. Twitter followers 9,440. Palo Alto, California About Blog Cancer Commons is a nonprofit collecting and learning from real patient experiences to give cancer patients the information they need. Guided by the latest scientific knowledge, they recommend the best available resources, based on each patient’s distinct profile. Facebook fans 627. Twitter followers 1,897. Urbana, IL About Blog Writer sharing, selling, and sometimes eating my words. Fighting a rare brain stem tumor in my spare time. Facebook fans n/a. Twitter followers 4,114. Natick, Massachusetts About Blog THC Total Health Care is a resource to help you uncover the truths behind the Cannabis plant and its medical benefits. Oklahoma, USA About Blog Survival With Kids is a website where I share information relating to my husband's brain cancer (Glioblastoma), Catholicism (mostly related to raising Catholic kids), car seats and a little bit of prepping/preparedness. Facebook fans 126. Twitter followers 45. Australia About Blog This blog is about Pippa's journey with a Brain Tumour. Surrey, United Kingdom About Blog The IBTA is an alliance of the support, advocacy and information groups for brain tumour patients and carers around the world. Their mission is to advocate for the best treatments, information, support and quality of life for brain tumour patients, offering them, their families and carers hope – wherever they live in the world. Facebook fans 1,039. Twitter followers 2,734. Phoenix, AZ About Blog Dr Peter Nakaji is a board certified neurosurgeon who specializes in brain & spinal tumors, as well as vascular, endoscopic & minimally invasive neurosurgery. Facebook fans 353. Twitter followers 73. Connecticut, USA About Blog The Connecticut Brain Tumor Alliance is a non-profit organization dedicated to offering support and compassion. Our mission is to raise awareness of the disease, provide hope and support for others living with brain tumors in Connecticut and raise money to support and advocate the cutting-edge research we all know someday will find a cure. Facebook fans 1,059. Twitter followers 842. About Blog Advanced Neurosurgery Associates (ANA) provides world class neurological care to patients of all ages, including pediatric neurosurgery. Facebook fans 2,158. Twitter followers 250. Sacramento, CA About Blog Liz is a brain cancer survivor, advocate and blogger. Facebook fans 920. Twitter followers 3,383. Chappaqua, NY About Blog A foundation dedicated to the care, comfort and cure of children with brain and spinal tumors. Facebook fans 1,174. Twitter followers 422. Australia & US About Blog The Robert Connor Dawes Foundation is a registered charity supporting pediatric brain tumour matters in the areas of Research, Care & Development. Facebook fans 7,077. Twitter followers 405. UK About Blog Brain Tumour Support is the only charity in the South West & Midlands dedicated to supporting anyone affected by any type of brain tumour. Facebook fans 3,785. Twitter followers 3,840. Chappaqua, NY About Blog A Kids’ Brain Tumor Cure Foundation (PLGA) helps to battle the most common forms of brain tumors in children by raising funds for medical research. Facebook fans 2,573. Twitter followers 644. Redmond, WA About Blog End Brain Cancer is furiously committed to finding a cure for brain cancer and to bringing hope to the lives of patients and their families. Facebook fans 8,138. Twitter followers 2,719. About Blog The story of a brain tumor survivor's experience, struggles and hope. This blog as a way to share author's story with others. His mission is to educate, inspire and be an outlet for those who are currently undergoing treatment or who are just diagnosed. Facebook fans 249. Twitter followers 410. Leesburg, VA About Blog The Smashing Walnuts Foundation strives to raises awareness of pediatric cancer and to raise funds to support research to find cures for pediatric brain cancer. Facebook fans 34,024. Twitter followers 2,357. UK About Blog My name is Gideon Burrows and this is my blog about bicycles and brain tumours. In April 2012, an MRI scan found what a surgeon later confirmed: I have an inoperable brain tumour that was giving me mild epileptic seizures. If you are or have been touched by brain tumour, or any kind of cancer, I hope you find what I have to share useful. United States About Blog The "happy blog" of the Damm family, named long before Steve's brain tumor. Facebook fans n/a. Twitter followers 936. Saskatoon, SK Canada About Blog In August 2012, I was diagnosed with a brain tumor. Read my complete story on my blog GREYMADDER. Facebook fans n/a. Twitter followers 4,274. Sydney, Australia About Blog Cure Brain Cancer Foundation is the peak organisation for brain cancer research, awareness and advocacy in Australia founded in 2001 by Charlie Teo. Facebook fans 56,363. Twitter followers 3,691. UK About Blog The leading UK charity in our field, funding pioneering research, providing support & info and raising awareness. Its aim is to improve understanding, diagnosis and treatment of brain tumours to improve outcomes for everyone affected. Facebook fans 33,953. Twitter followers 17,152. Milton Keynes, England About Blog Brain Tumour Research is building a network of experts in sustainable brain tumour research. Together we will find a cure. Chicago, IL About Blog The ABTA is the first & the only U.S. organization committed to funding brain tumor research & providing education & information on all tumors & all ages. Watch videos on Youtube. Facebook fans 25,434. Twitter followers 5,051. Washington, DC About Blog Accelerate Brain Cancer Cure is committed to speed the pace of research that will lead to new brain cancer therapies and, ultimately, a cure. Facebook fans 20,721. Twitter followers 6,120. United Kingdom About Blog Aunty M Brain Tumors is Interactive Support Online. Claire Bullimore is a Brain Tumor Survivor and support advocate and founder of Aunty M Brain Tumors. Facebook fans 12,815. Twitter followers 3,038. Santa Monica, CA About Blog The Pacific Neuroscience Institute located at the John Wayne Cancer Institute and Providence Saint John's Health Center specializes in the treatment and care of patients with pituitary, brain and skull base tumors and other neurological disorders. Oklahoma City, OK About Blog Videos provided from the Oklahoma Brain Tumor Foundation regarding the patients, caregivers, physicians, and volunteers. OKBTF is a nonprofit organization dedicated to providing education, support and advocacy for Oklahoma children and adults with a brain tumor and their families to improve their quality of life and help find a cure. Facebook fans 1,727. Twitter followers n/a. Olympia, WA About Blog I am a 24 year old woman in the fight for my life!! As I battle an Astrocytoma that is leeching into my brain. Luckily, I don't take a death sentence lying down!! Here is my story, hope you enjoy!! Facebook fans n/a. Twitter followers 893. Canada About Blog A diary of our life and times together. April 2015 was a game changer for us both., Kevin was diagnosed with glioblastoma multiforme brain cancer. Carmel, NY About Blog Our organization seeks less toxic, more effective treatments that are specifically designed for children fighting cancer. Our ultimate mission is to help fund the intelligence and technology that will uncover new ways to cure Ty fought AT/RT brain cancer more than two years. His mother documented his tremendous journey fighting cancer, and shares the raw emotion of everyday life after losing him. Facebook fans 20,658. Twitter followers 1,839. Facebook fans 13,749. Twitter followers 1,071. County Durham About Blog Hi I’m Anna Louise Swabey. I am 23 years old and have recently been diagnosed with a terminal brain tumour (It still feels bizarre when I write that down or say it out loud). I have decided to start writing about my ‘brain tumour journey’, in the form of this blog “Inside My Head”. Facebook fans 10,386. Twitter followers 544. Midwest, United States About Blog This page was created to give Oliver and his family the encouragement and support they need. As well as to raise awareness for DIPG (Diffuse Intrinsic Pontine Glioma) or Pediatric Brainstem Cancer. Facebook fans 4,866. Twitter followers n/a. Australia-Egypt-UK About Blog This blog was a forum for me to put forward my campaigns and theories on health and wellness within a traditional, mainstream context. But two years ago my whole outlook on health transformed radically with the diagnosis, surgery and fallout of my little girl being diagnosed with an enormous brain tumor. Facebook fans 1,715. Twitter followers 3,127. Facebook fans n/a. Twitter followers 3,165. Chattanooga, TN About Blog This is the story our of journey with Nathan's bone marrow transplant. Nathan was diagnosed with Severe Combined Immune Deficiency. This is fatal without a bone marrow transplant. Facebook fans 2,173. Twitter followers 211. San Diego, CA USA About Blog A physical therapist who suddenly became a meningioma brain tumor patient. He is a physical therapist who suddenly became a meningioma brain tumor patient. Facebook fans 1,216. Twitter followers 1,508. 55. Barr's Battle Brain Cancer! Prince George, VA About Blog In November 2012, my wife Melissa was diagnosed with a brain tumor...grade three brain cancer. I started blogging the day we found out...talking about life, cancer, family, and whatever is on my mind. Philadelphia, PA About Blog The Children's Brain Tumor Tissue Consortium is committed to discovering new cures and better therapies for children with pediatric brain tumors. Facebook fans 1,397. Twitter followers 150. York About Blog OSCAR’s PBTC (Ongoing, Support, Care and Research into Paediatric Brain Tumours Charity) was formed in the summer of 2014. The Charity was formed by the parents and friends of Oscar Hughes, a 9 year old boy who died of a Medulloblastoma (a brain tumour) on the 3rd of May 2014. Facebook fans 993. Twitter followers 209. About Blog This blog tells the story of recovering from Angela Conway's craniotomy, as well as first finding the tumour. Facebook fans 482. Twitter followers 497. Frisco, TX About Blog Beloved and gentle husband, daddy, son, brother, friend, co-worker and neighbor who battled brain cancer - a glioblastoma in the brain stem that we call Spot. That Damm Spot was released with Steve's peaceful passing on September 7, 2009. Washington D.C. About Blog Jeanneane Maxon is a pro-life Speaker and advocate, World Traveler, Fun Aunt, People Lover, Wanderlust Evangelist, Christ-follower and a brain-cancer -survivor-in-process. Facebook fans n/a. Twitter followers 875. Singapore About Blog Brain Tumour Society Singapore (BTSS) is a non-profit organization registered in Singapore to provide support for brain tumour patients and caregivers. Facebook fans 857. Twitter followers n/a. About Blog My name is Faith. I’m the mother of five children. Three are living. My youngest was diagnosed with terminal brain cancer on memorial day of 2013, when he was 3. His name is John John. I am a follower of Christ, I claim victory over death by the power of the cross. Facebook fans 765. Twitter followers n/a. About Blog Journey after losing my 5 year old daughter to brain cancer. About Blog This is a place where I can share my story and current situation I am in which is that I have been diagnosed with an agressive brain cancer stage 4. Cheverly, MD About Blog The Golf Ball in My Brain - Journey of recovery from a brain tumor. Boston, MA About Blog Hi my name is Jeremy, and I have brain cancer. I am a childhood cancer survivor and living with brain cancer. Facebook fans 247. Twitter followers 182. About Blog My journey with brain cancer began very suddenly in December 2011. After years of complaining of headaches, migraines and other symptoms, my doctor finally sent me for an MRI on November 26, 2011. Road Elmhurst, IL , Chicago About Blog Get latest news on brain tumor from CyberKnife Center of Chicago. CyberKnife Advantage CyberKnife Center of Chicago treats many different types of cancer. Rowlands Gill, UK About Blog As this blog title suggests, the chances of me (the sibling of a brain tumour victim) developing my very own brain tumour, were apparently ridiculous. They are the kind of odds that would make a movie or book seem preposterous and detract from any story-telling magic. Yet here I am, nearly 10 years after my beloved brother, Graeme Turner, died, embarking on my own journey. California State University, Fullerton About Blog This blog captures the experiences with Darrell's glioblastoma multiforme (GBM). About Blog This blog is about Julie's Brain Tumour Journey. Shrewsbury, MA, United States About Blog A blog about adoption, parenting, and living with childhood cancer, specifically a Glioblastoma Multiforme (GBM) brain tumor. Ewa Beach, HI, U.S About Blog In October 2008, 3 year old Lily was diagnosed with 2 types of Cancer. In 2012 her mom was diagnosed with 2 types of cancer. Here are the current updates on Lily's family, their tumors, treatment and living with Li Fraumeni Syndrome. 77. Toom-ah? What Stinkin' Toom-ah! About Blog A blog about brain cancer and survival. About Blog This blog is about a little muncher's story of brain cancer. About Blog Follow Tillery's journey of hope through life with a brain tumor. About Blog Atticus was with a diagnosed with a brain tumor on August 26th 2016. It is now confirmed that it is a very rare form of brain and spinal cancer called a Choroid Plexus Carcinoma. We are currently living in Seattle getting ready to start Chemo. Surgery was very successful and we are so appreciative of our amazing tumor team here. Boston, Massachusetts About Blog My name is Courtney Dueck, also known as Queen C. While “Adventure” might be an understatement when you look at the past year months which has not only consisted of my own wedding, but brain surgery, a cancer diagnosis, and treatment plans starting with radiation in Boston Massachusetts, it certainly has been a journey! I created this blog in order to update friends and family of my whereabouts. About Blog Finding hope and raising awareness, and funding for research, in the darkness caused by brain tumours. UK About Blog This site is an excellent resource for brain cancer survivors. We aim to provide 1:1 support to people who are currently undergoing treatment for cancerous brain tumors. Our organization provides support by pairing up people who have undergone brain cancer treatment with people are going through the experience now. About Blog This blog is about Deb and her brain tumour. About Blog The leader of the Fighting Through Fitness effort and the co-founder is Michael Moyles. About Blog Our sweet son, James Camden, was diagnosed with a brain tumor on June 23, 2011 at 7 and a half months old. We are so determined to think positively and we know that God has a perfect plan for James! Hanover, Massachusetts About Blog My Battle With a Low-Grade Brain Tumor, Oligodendroglioma. Research on Brain Cancer Supplements, Marijuana, & New Clinical Trials. Illinois, United States About Blog This blog is all about how John used humor to remain sane while dealing with the insanity of a brain tumor the size of his wife’s fist. About Blog Story of the author who was diagnosed with Cushing's disease caused by a pituitary adenoma. About Blog A journey about living with a oligodendroglioma brain tumour. My art, treatment, family and my life. Oro Valley, Arizona About Blog Anne Breen is an meningioma survivor since 1986 in my own FDA investigational clinical trial of mifepristone (RU-486) for meningioma control since Feb 2005. Meningiomas are now 34% of new primary brain tumors, more than GBMs and strike twice as many women as men, yet no standard chemo exists. About Blog This blog is about the story of Patrick Macedo living with a brain tumor. United States About Blog The author of this blog is Tara Lynn Bodrero who is fighting with life-threatening brain cancer. Minneapolis, MN About Blog Love Your Melon is an apparel brand dedicated to giving a hat to every child battling cancer in America as well as supporting nonprofit organizations who lead the fight against pediatric cancer. Facebook fans 834,028. Twitter followers 32,234. London, ON (serving Canada) About Blog Brain Tumour Foundation of Canada is a national, not-for-profit organization dedicated to reaching every Canadian affected by a brain tumour through support, education, information and research. Facebook fans 17,667. Twitter followers 3,983. 99. Cancer Girl Smiles | Today I decide to live! Cranbury, NJ 08512 About Blog CONQUER Magazine is a resource for patients with brain cancer, addressing issues that patients, their families, & caregivers face. Facebook fans 1,444. Twitter followers 463. 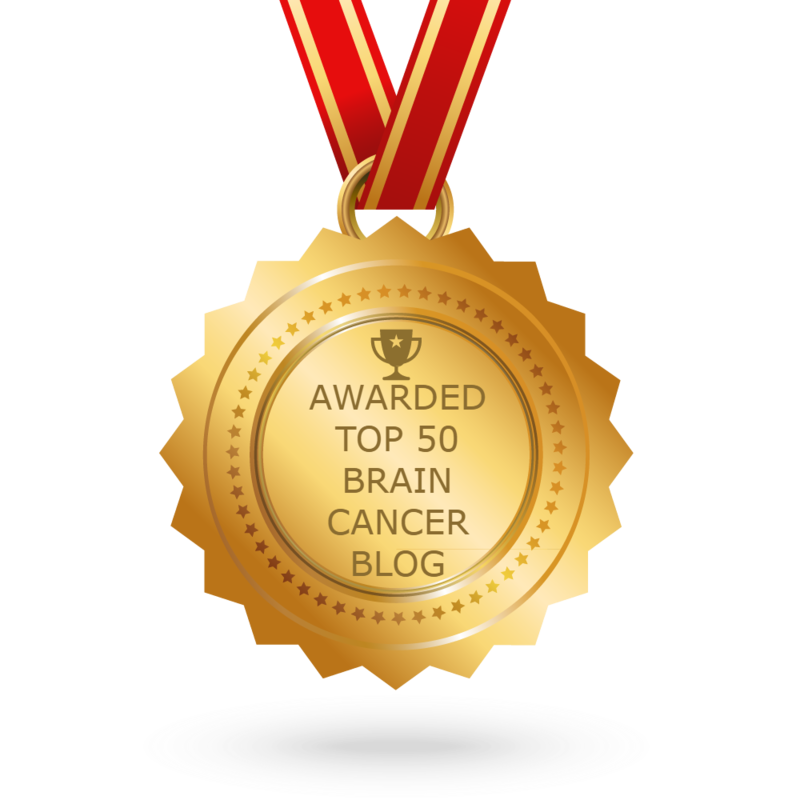 CONGRATULATIONS to every blogger that has made this Top Brain Cancer blogs list! This is the most comprehensive list of best Brain Cancer blogs on the internet and I’m honoured to have you as part of this! I personally give you a high-five and want to thank you for your contribution to this world.